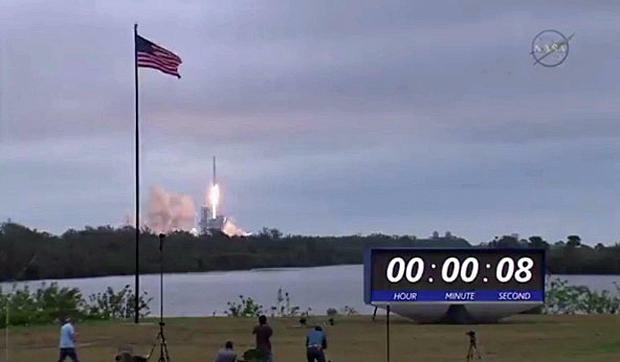 Using NASA’s historic pad 39A, which once sent Apollo moonships and space shuttles on their way, a SpaceX Falcon 9 rocket blasted off from the Kennedy Space Center Sunday, boosting a Dragon cargo ship into orbit to deliver nearly 5,500 pounds of equipment, supplies research material to the International Space Station. It was the first use of pad 39A since the shuttle Atlantis blasted off on the program’s final mission in July 2011 and despite heavy cloud cover, the Falcon 9’s fiery climb away from the familiar launch complex sent a thrill through spaceport workers, area residents and tourists who were disappointed by a last-minute delay Saturday. Their patience was rewarded with a launch and a landing. While the rocket’s second stage was boosting the cargo ship to orbit, the first stage successfully flew itself back to a pinpoint touchdown at the nearby Cape Canaveral Air Force Station, dropping out of the clouds atop a jet of flame after rocking the area with sonic booms. It was the California rocket builder’s eighth successful booster recovery in 13 tries, its third at the Air Force station, in an on-going push by SpaceX founder Elon Musk to lower costs by recovering, refurbishing and re-launching spent stages. But the primary goal of the mission was to lift the Dragon cargo ship into orbit and to inaugurate the repurposed launch pad, which was heavily modified to convert it from shuttle use to the Falcon 9. The mission got underway at 9:39 a.m. EST (GMT-5) when the 229-foot-tall Falcon 9’s nine Merlin 1D first-stage engine ignited with a roar, throttled up to full power and quickly pushed the booster away from its transporter-erector at the top of the pad. Liftoff came a day late because of a problem with the rocket’s second stage steering system that stopped the countdown Saturday just 13 seconds before launch. Engineers resolved the problem overnight and despite concerns about the weather, the countdown ticked smoothly down to engine ignition Sunday. Arcing to the east atop 1.7 million pounds of thrust, the slender Falcon 9 rapidly shed weight and smoothly accelerated as it consumed its first-stage load of liquid oxygen and RP-1 kerosene rocket fuel, breaking through the “sound barrier” a little more than a minute after liftoff as it climbed through the dense lower atmosphere. The first stage engines shut down as expected about two-and-a-half minutes after liftoff, the stage then fell away and the single engine powering the Falcon 9’s second stage ignited to continue the push to orbit. The first stage, meanwhile, flipped around and fired three of its engines to reverse its forward progress and put it on a trajectory back toward Cape Canaveral. A second engine firing then slowed the craft for its plunge back into the thick lower atmosphere. Deploying so-called “grid fins” to control its orientation and trajectory, the booster plunged toward the landing pad tail first, restarting its center engine for the final time. Four landing legs then deployed and locked in place and the rocket stage settled to an on-target touchdown. Two minutes later, the Falcon 9 second stage finished its climb to space and at 9:49 a.m., about 10 minutes after liftoff, the Dragon cargo ship was released into the planned preliminary orbit. A few moments later, its two solar panels deployed and SpaceX reported the craft was in good health going into a two-day rendezvous. If all goes well, the Dragon will catch up with the International Space Station early Wednesday, pulling up to within about 30 feet and then standing by while the lab’s robot arm, operated by European Space Agency astronaut Thomas Pesquet, locks onto a grapple fixture. At that point, flight controllers at the Johnson Space Center will take over arm operations, pulling the Dragon in for berthing at the forward Harmony module’s Earth-facing port. Carried inside the Dragon’s pressurized compartment, the section accessible by the station crew, are 580 pounds of crew supplies, 842 pounds of spare parts and other vehicle hardware and more than 1,600 pounds of science gear. Twenty mice also are on board to help researchers learn more about what processes prevent most vertebrates from regrowing lost limbs or tissue. All 20 will be euthanized, dissected on the station and returned to Earth aboard the Dragon for comparisons with mice that underwent the same protocols on Earth. Also on board: methicillin-resistant Staphylococcus aureus, or MRSA, in an experiment to learn more about how the deadly bacteria mutate to design more effective drugs. “We are excited to put MRSA, which is a superbug, on the International Space Station and investigate the effects of microgravity on the growth and mutation patterns of these bugs,” said Anita Goel, chairman and science director of Nanobiosym, which developed the experiment with the Center for the Advancement of Science in Space. Mounted in the Dragon’s unpressurized “trunk” section are a $92 million ozone monitoring experiment, a $7 million sensor to monitor lightning strikes and experimental gear designed to help engineers perfect autonomous rendezvous and docking software. The lightning sensor, the RAVEN rendezvous experiment and the SAGE III ozone hardware will be extracted from the Dragon’s trunk by the station’s robot arm and mounted on platforms along the lab’s solar power truss. Sunday’s launching marked the second success in a row for SpaceX following an on-pad explosion Sept. 1 at the Cape Canaveral Air Force Station that destroyed a Falcon 9, it’s $200 million satellite payload and heavily damaged launch complex 40. The mishap was the company’s second in 29 rockets following an in-flight breakup in June 2015 that destroyed another station-bound Dragon cargo ship. Both accidents were blamed on problems with the helium pressurization system used in the Falcon 9’s second stage. Hardware and procedures were changed to minimize the chances for another mishap and SpaceX successfully returned the Falcon 9 to flight with a Jan. 14 launch from Vandenberg Air Force Base, Calif., that boosted 10 Iridium satellite telephone relay stations into orbit. The company hopes to return pad 40 to service in the May timeframe and will use 39A at the Kennedy Space Center for the next several flights, launching an EchoStar communications satellite around the end of the month followed launch of an SES relay station in March, the first using a refurbished first stage. Those two flights will be followed by launch of an Intelsat communications station and then another cargo mission to the space station. Since the explosion five months ago at the Air Force station, engineers worked around the clock to complete extensive modifications to the historic pad where huge Saturn 5s once boosted Apollo astronauts to the moon, where the shuttle Columbia took off on the program’s first flight in 1981 and where Atlantis climbed away on the final flight in 2011. A large rocket-processing hangar at the base of the elevated pad now blocks the old river-rock roadway where massive crawlers once carried Saturn rockets and space shuttles. Falcon 9s will be carried from the hangar, which can house five rockets at a time, to the top of the pad horizontally by a transporter-erector and then raised vertical using a powerful hydraulic system. Propellant lines leading to liquid oxygen and kerosene fuel tanks are in place along with a revamped water deluge system to cool pad structures during launch and to deaden the acoustic shock of engine ignition. Data and power lines have been installed and the old flame trench bisecting the pad to carry exhaust away has been partially filled in with hydraulic and other systems. SpaceX is slowly dismantling the old payload changeout room that used to swing into place around space shuttles before launch but will keep the central fixed service structure gantry. A crew access swing arm will be installed later for use by astronauts boarding SpaceX commercial crew capsules for flights to the International Space Station. SpaceX officials say the modifications will exceed $100 million when the work is complete. If all goes well, SpaceX hopes to launch a heavy-lift version of the Falcon 9 sometime this summer, a booster made up of three first stages bolted together and a standard single-engine second stage. In November, an unpiloted Dragon crew capsule will be launched from pad 39A on a test flight before the first spacecraft carrying astronauts takes off next year.